Every three to five years Congress is required to authorize funding and set policies for the Federal Aviation Administration (FAA). AFA's top legislative priority for this FAA reauthorization is to have Congress increase the minimum rest requirements for Flight Attendants. Seven Flight Attendant fatigue studies, commissioned by Congress, concluded that the best way to combat fatigue is to get more rest. We call on all Flight Attendants to Rally for Rest at the U.S. Capitol in Washington, D.C. on Wednesday, March 16, 2016 in support of 10 hours minimum rest for all Flight Attendants. There is interest in both congressional chambers to include 10 hours minimum rest in a long-term FAA authorization bill. We have an opportunity to immediately improve rest. Flight Attendant's rest should equal pilot rest in order to do our work as aviation's first responders. 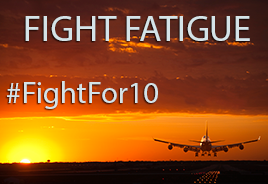 Join all Flight Attendants to Rally for Rest at the U.S. Capitol in Washington, D.C. on Wednesday, March 16, 2016 in support of FAA minimum 10 hours rest for all Flight Attendants.